This is my “not-so-bariatric” boyfriend trying his best not to look annoyed at having been asked to hold the popsicle for this photo! It’s summer! Sorta. I mean…theoretically it’s summer. Even on the calendar it is summer. Someone forgot to send Baltimore the memo. 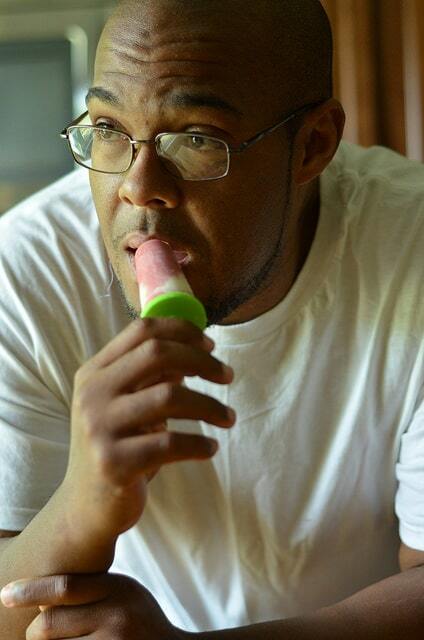 Still there’s been enough hot days where I’m in a popsicle kinda mood. And when I eat popsicles I love to eat protein popsicles. Because…it’s killing two birds with one stone right? You get to slurp away happily at cold yumminess while getting the all-important proteins! What could be better? Since my kids are gone (they live with dad in Texas during the summer) I decided this go-round I’d make a more grown-up popsicle. Because I actually do have a pretty refined palette (no…really I do…I eat more than just peanut butter!). 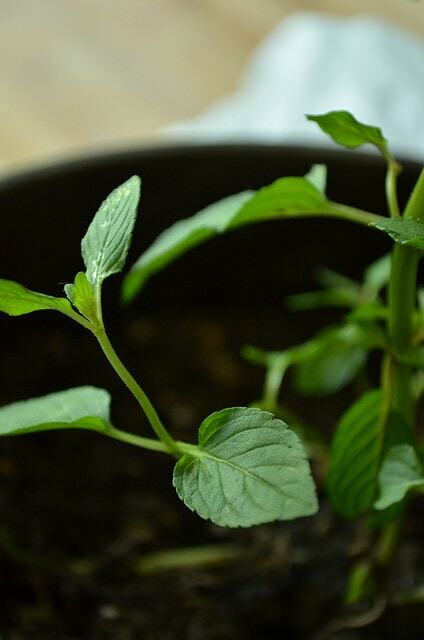 Plus I have this mint plant my friend Julia gave me. And against all odds the darn thing is still alive. And growing. Very big leaves. Now I’m no botonist but I’m fairly sure that I’m supposed to pluck some of these leaves for the plant to continue to thrive. (…Or not…you guys will probably say I’m wrong there…it’s cool…) S’anyway, that’s where this adventure started. Well that and an area of curiosity. How well do strawberries and mint go together? That had me thinking for a while because it seems like I should have had the two together but I swear on my Bassett Hound I have not. Not that I recall anyway. But I had a feeling I would love it. I call that a food premonition. Anyhoo…another part of the kids being gone is the fact that I get to shop for two (me and the ol’ ball & chain) which means I can hunker down and make really affordable meals and treats. This one was super-affordable because strawberries are literally EVERYWHERE. I can’t take a step in any direction without seeing them on sale. One day at Aldi I saw them for $1.25/carton and I decided to throw caution to the wind and buy three cartons (we really, really like strawberries). Then I went to my local grocery store and found out that my favorite Greek yogurt cups were on sale for $0.89/each. The popsicle molds cost a dollar at the dollar store. The mint was FREE! So that all made me pretty happy. I’m currently trying to save up to throw myself a decent 40th birthday bash (my birthday is in December if you’d like to start planning your gift…lol) so I need as many coins as I can get my grubby little hands on! Plus doing stuff like macerating strawberries and carefully ladling them into popsicle molds totally gives me my Martha Stewart fix. It all feels very wonderful and domestic and summery and makes me really wish I knew how to bake bread – and simultaneously glad that I don’t! So you guys know that BiPro USA is my whey isolate protein of choice, right? Well it is! Which is why most of the protein recipes on this blog contain it. It’s just a really good quality, clean protein without a bunch of extra ingredients. Anyhoo…you may have known about their chocolate, French Vanilla, and unflavored options (especially the latter because BiPro is the only unflavored protein I use!) but now they have strawberry! made from only the highest quality ingredients? had no coloring additives and real pieces of dehydrated strawberries? If your answer was “none” or “I don’t know,” I’m going to need you to get excited with me about this, mkay? Because this is good clean strawberry protein that will change your life, especially since BiPro has already gone to the trouble of figuring out a few ways for us to use it. Until then…cheers to (fake/intermittent) summer! These swirly protein pops are tasty and fun. They take just minutes to mix up and give you a powerful protein punch, along with a cool, sweet treat that screams summer! In a bowl, mix together strawberries, sweetener and chopped mint. (NOTE: This may seem like a lot of sweetener in relation to the strawberries but remember that freezing things dulls sweetness so using a bit more sweetener ensures the sweetness carries through. Feel free to reduce if you don't like sweet things!) Refrigerate at least one hour to macerate. Combine strawberries and protein powder in a blender and blend until fully pureed. 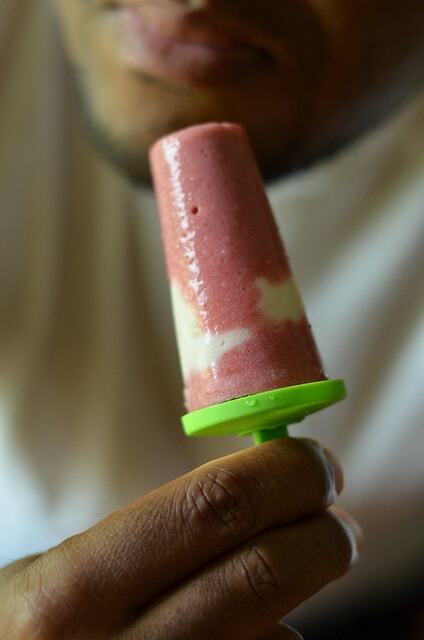 In a popsicle mold, use a tablespoon measure to fill 1/3 of the mold with the strawberry mixture. Next, use a separate tablespoon measure to fill the second third with yogurt. Finally, fill the last third with strawberry mixture. 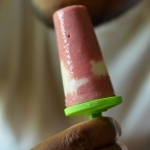 Insert the popsicle handles into the mold and freeze at least two hours or until solid. TO REMOVE POPS: Run your popsicle mold under room temperature water until you can twist the handle, then extract the pop from the mold. I love these but i have a hard time removing them from the plastic popsical containers. Any tips? Usually I just run the popsicle mold under room temperature water until the pop loosens up. Usually takes a full 1-2 minutes but it does happen! I hope that helps.